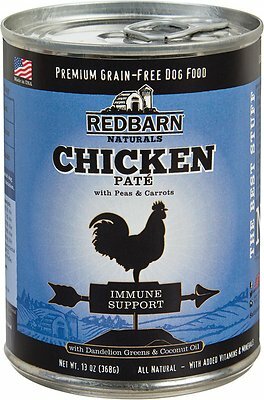 Redbarn Naturals Chicken Pate Immune Support Grain-Free Canned Dog Food has high-quality chicken as the first ingredient. Functional ingredients have been added to support your dogs' optimal health, such as dandelion greens, which provide many vitamins and minerals and are also high in protein. They are also a mild liver and digestive stimulant that can help support waste elimination. Coconut oil, which is composed of medium chain triglycerides (MCTs), helps to support immune function and healthy skin and coat. High-quality chicken is the #1 ingredient in this complete and balanced adult food with added vitamins and minerals. Added superfoods support your pet's overall health. Coconut oil is rich in medium chain triglycerides that support immune function, while dandelion greens help with digestion. Absolutely no carrageenan, artificial colors, flavors, or preservatives, no you can be confident you're feeding your pup the best. High-quality chicken is the #1 ingredient in this complete and balanced cat food with added vitamins and minerals. Chicken, Chicken Broth, Dried Egg Whites, Peas, Agar-Agar, Carrots, Potassium Chloride, Dandelion Greens, Coconut Oil, Dicalcium Phosphate, Salt, Calcium Carbonate, Zinc Proteinate, Iron Proteinate, Calcium Carbonate, Copper Proteinate, Manganese Proteinate, Sodium Selenite, Calcium Iodate, Vitamin E Supplement, Thiamine Mononitrate, Niacin Supplement, Calcium Pantothenate, Biotin, Vitamin A Supplement, Riboflavin Supplement, Vitamin B12 Supplement, Pyridoxine Hydrochloride, Vitamin D3 Supplement, Folic Acid. 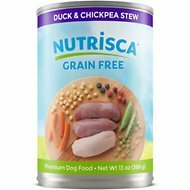 New Formula: Chicken, Chicken Broth, Chicken Liver, Peas, Dried Egg Product, Agar-Agar, Carrots, Calcium Carbonate, Chicken Cartilage, Dandelion Greens, Coconut Oil, Potassium Chloride, Salt, Choline Chloride, Salmon Oil, Green Lipped Musssels, Beta-Carotene, L-Carnitine, Zinc Proteinate, Iron Proteinate, Copper Proteinate, Manganese Proteinate, Sodium Selenite, Calcium Iodate, Ascorbic Acid, Vitamin E Supplement, Thiamine Mononitrate, Niacin Supplement, Calcium Pantothenate, Biotin, Vitamin A Supplement, Riboflavin Supplement, Vitamin B12 Supplement, Pyridoxine Hydrochloride, Vitamin D3 Supplement, Folic Acid. 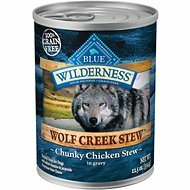 Feed 1 can per day for 10 lbs of body weight for an Adult dog. Adjust feeding amount for your dog’s body condition, lactation, growth & gestation. Refrigerate unused portion. Mix your dog's current food with his new food. Over 4 weeks, gradually decrease the amount of the current dog food while increasing the amount of new dog food. Week 1: Start with 1/4 Redbarn Food and 3/4 Other Food. Week 2: Gradually increase to 1/2 Redbarn Food and 1/2 Other Food. Week 3: Feed 3/4 Redbarn Food and 1/4 Other Food. 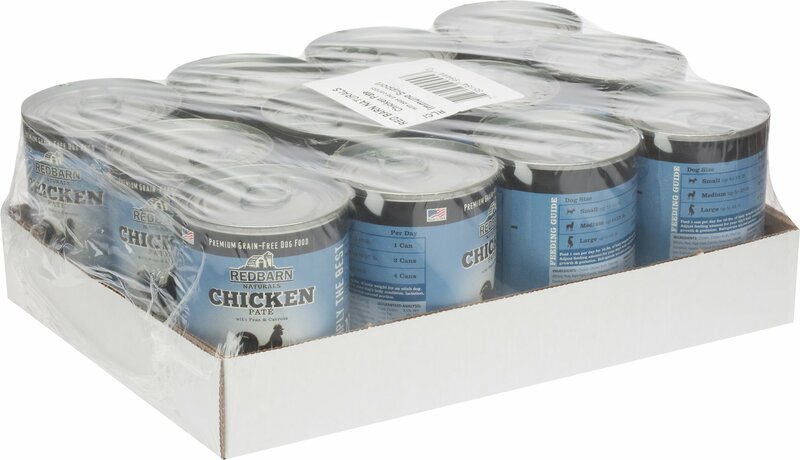 Week 4: You are now able to feed your pet 100% Redbarn Food. From peanut butter or cheese to flavors like beef, pork and lamb, Redbarn offers a wide variety of fun and tasty treat flavors to indulge your dog's cravings. Whether he enjoys crunchy treats that support his skin and coat, or all-natural bully sticks that are perfect for your time away from home, these goodies are made for any occasion. Packed with rich, meaty goodness in a variety of flavor options, Redbarn treats and food options provide the nutrition that your dog needs and taste that he can't resist. 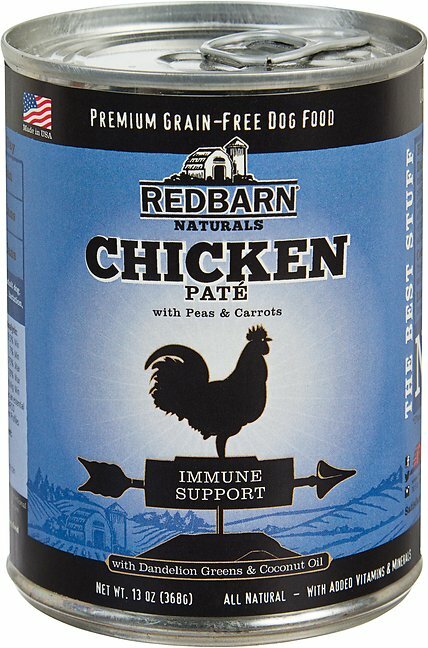 Redbarn's variety of natural products offers treats and food for all life stages and breeds. From single-ingredient treats to grain-free options, Redbarn Naturals are free of artificial preservatives, colors and flavors for a tail-wagging, tasty reward. Made with high-quality ingredients and free of any artificial chemicals, you know that your pup is getting just what nature intended—only the best. Made with specific health concerns in mind, Redbarn Chew-a-Bull treats make it easy to promote healthy joints, skin and coat, and more. Made of natural Redbarn bully sticks and coated with peanut butter or beef flavoring, these crunchy, high-protein and low-fat dog chews are free of corn, soy and grains for dogs with food sensitivities or intolerances. Chew-A-Bulls also contain salmon oil and vitamin E to promote your pup's immune system, heart and cognitive health all while supporting his shiny coat! All Redbarn foods are made without any artificial preservatives to ensure that your dog is getting only the highest-quality nutrition. Redbarn canned food always starts with real meat as the first ingredient and is made with only 13 or fewer functional ingredients to give your dog all of the goodness that he needs without any grains, gluten or fillers. Redbarn rolled food is super versatile—use it as a topper, treat or stand-alone meal to give your pup flavor and texture variety. Redbarn's best-sellers, bully sticks, are made from free-range and grass-fed beef for a high-quality treat that you can feel good about giving your pup. Made in a variety of shapes and sizes, these treats are perfect for all sizes and breeds of dogs for a long-lasting chew that promotes dental health. Because these treats are all-natural, they are 100% digestible and extremely palatable for the perfect hard-earned reward or surprise for your time away from home. Since 1996, Redbarn has been dedicated to providing "simply the best" pet food and treats. Dedicated to providing the highest-standard products for your dogs and cats, Redbarn's premium ingredients provide delicious and nourishing dog food that your pet is sure to love. With extensive quality assurance, Redbarn ensures that each batch is tested before ending up in your four-legged family's food bowls. Just received this food today & I'm so in love with the texture and ingredients. Simply the best for my baby's & food advisor rated 4& half stars . Yes finally a great food for my baby's that I can afford. I have 2 of this. So greatful with it & the price. Please don't increase it. Sincerely, Clyde, Noah and mama. Dogs gobbled it up! Great ingredients. Will purchase again if I can catch another sale price.